I awoke early, packed my backpack and headed up the trail. The trail climbed steadily as it followed the North Fork of the Big Thompson River. Breaks in the forest gave me opportunity to scout the high country near Mt. Dunraven. I anticipated an easy day of backpacking to my next campsite, Lost Meadows. This was only a mile below Lost Lake, a high alpine tarn that is the end of the maintained trail. It was only five miles between campsites so I decided to take a side trip. Looking toward Mummy Mountain from Stormy Peaks South campsite. About halfway between Silvanmere Campsite and Lost Meadow was a spur trail that climbed the north side of the canyon to Stormy Peaks Pass. I left my backpack at the trail junction and started the 2000 foot climb to the pass with just lunch and water. 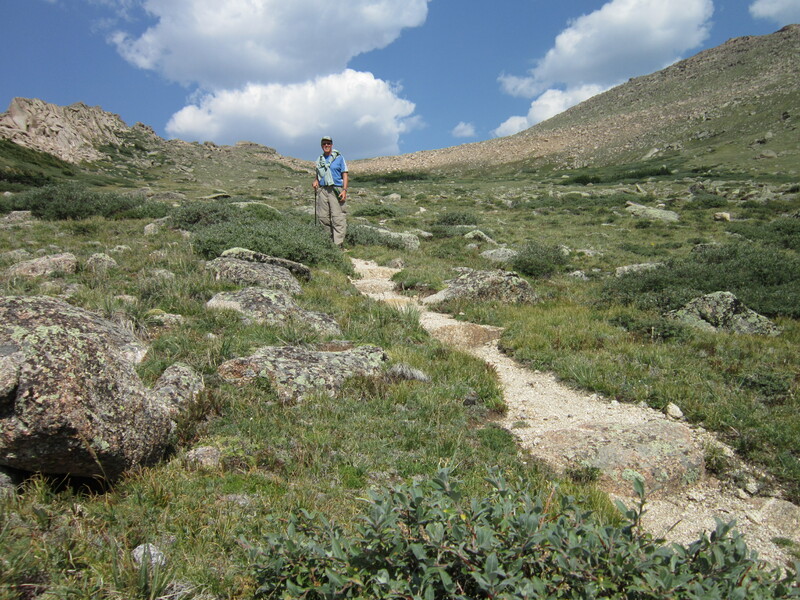 The trail started out a series of switchbacks that quickly climbed above timberline. Here I encountered a flat shelf in the ridge where the National Park located the Stormy Peaks South backcountry campsite. 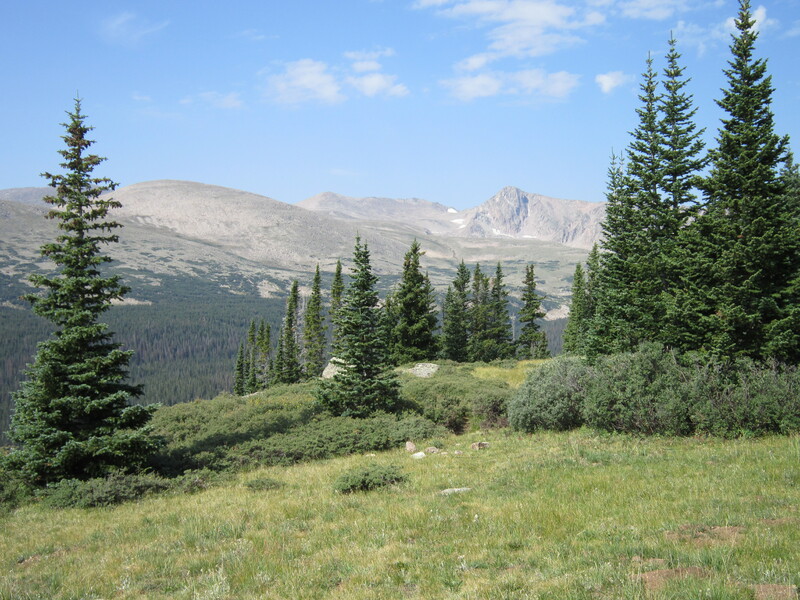 It certainly had a spectacular view of the upper Big Thompson canyon, Rowe Peak and Mt. Dunraven. The trail continued an additional 1.5 miles to pass. As I climbed towards the ridge line, I had to stop several times to scout how the trail proceeded. There was some thick growth of evergreen bushes and small trees where the trail seemed to disappear. I would be merrily hiking along and suddenly there was no trail beneath my feet, just alpine meadow. Now the meadow was fine for walking and I could find my own way, but the trail used the most efficient means to climb the ridge. It became a sort of game to find the trail in the midst of meadow and brush. Jesus is the way, the trail, that we seek to guide us through life. But it can be so easy to slip “off trail”, to think that I know the way on my own and don’t need Jesus. As I searched for the trail that morning, I reflected on who is my true trail guide. I finally reached a small peak just south of the pass. I knew that the next day, I would face the most difficult part of my backpack, climbing up over Mummy Mountain Ridge and down into the Black Canyon Trail. From the overlook near Stormy Peaks Pass, I could see the first half of my next day’s climb. It looked challenging but doable, so I hiked back down to my backpack and continued on to Lost Meadow campsite. Lord Jesus, you are the way. Keep me close to your path for my life. 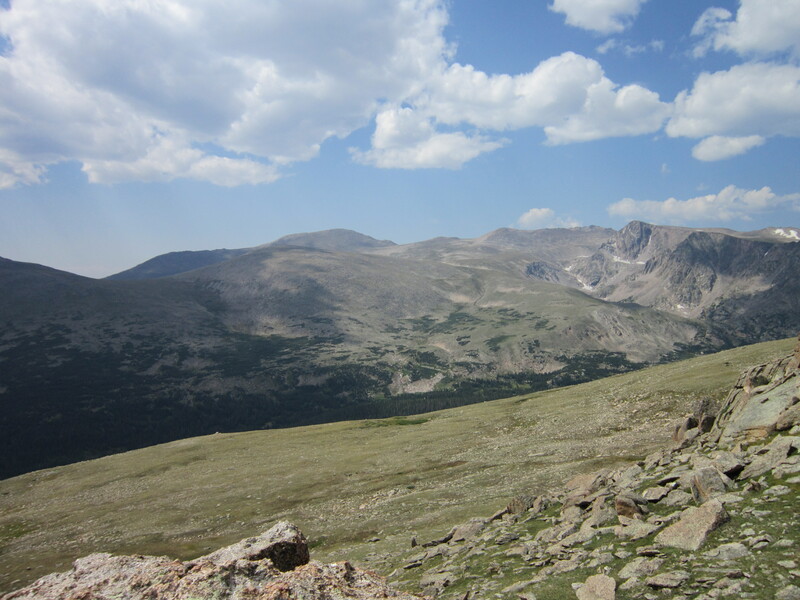 This entry was posted in Body Mind Spirit, Jesus, trust, Uncategorized and tagged I am the way, John 14, Rocky Mountain National Park, Stormy Peaks Pass on August 22, 2012 by Pastor John Keller.